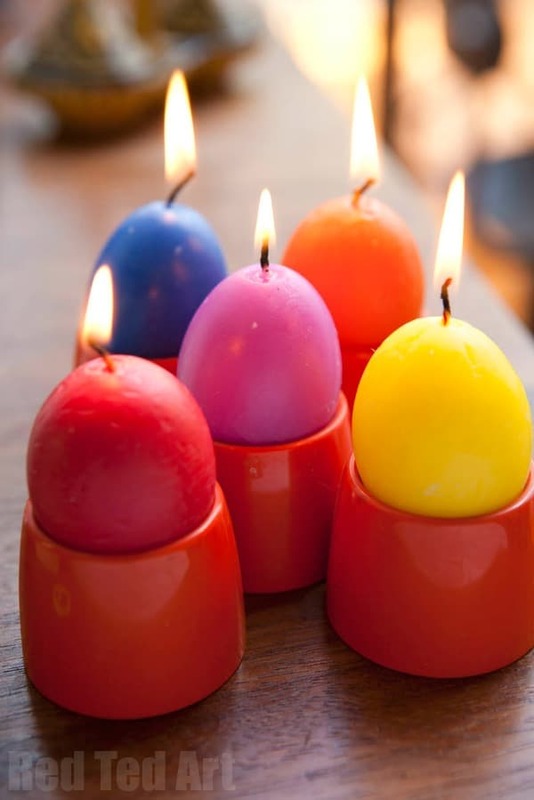 Welcome back to this week’s How To where I show you how to make a candle again – this time Crayon Egg Candles in time for Easter – so if your are looking for Easter Egg ideas or great Easter Gifts for Grown Up Ideas, look no further! 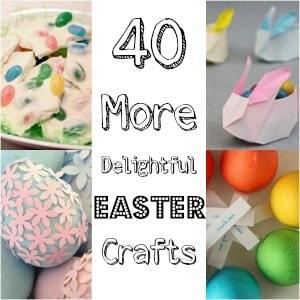 We love Easter Crafts to Inspire you!! 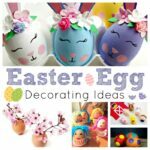 This is a good time to start planning your Easter Egg ideas, as you have to collect all your egg shells first and then you can decorate them or make these fun Easter candles. So you need plenty of time to prepare!! 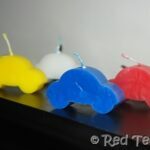 As you know, I have been on a candle making FRENZY recently – first I made and tested different types of homemade candle wicks and made some ice cube tray candles. Then I moved on to cookie cutter shape candles (car & star shaped) for my son’s birthday and FINALLY… we have these fabulous Egg Shell Candles. I got the idea from the fabulous Morning Sunrae and have been wanting to make these ever since I saw them. I think they will make great little Easter gifts too. 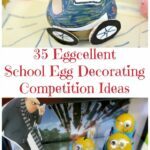 These Crayon Candle Eggs were first published in February 2012 and republished for your convenience! The great thing about my recent candle making sessions is that I used NO specialist equipment apart from buying some Borax to make the “best wicks ever“. But strictly speaking you can get away with out it. Though I recommend you do use it, or buy some real wicks. 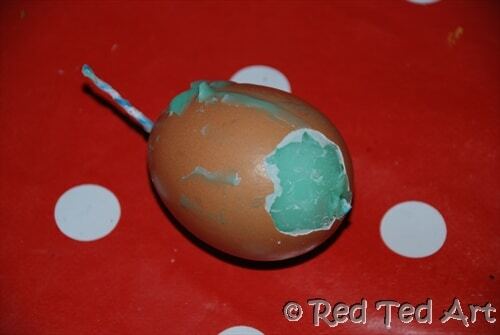 This first Egg Shell Candle is quicker and easier to make and probably more appropriate for children. I think they look just as cute though! 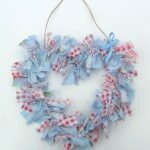 We love these as they are so very pretty! 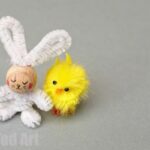 They take a little longer to make but do make wonderful Easter Gifts for Grown Ups. I adore how they are thrifty and yet look fantastic! 1) Make your homemade wicks. 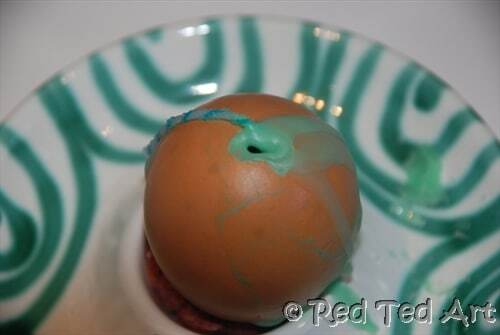 2) Follow the instructions on “egg blowing“. 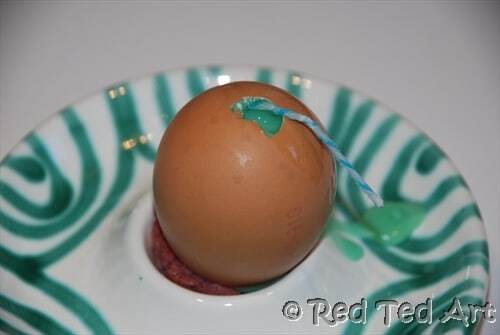 Make sureyou rinse your blown egg out thoroughly and let it dry inside and out. 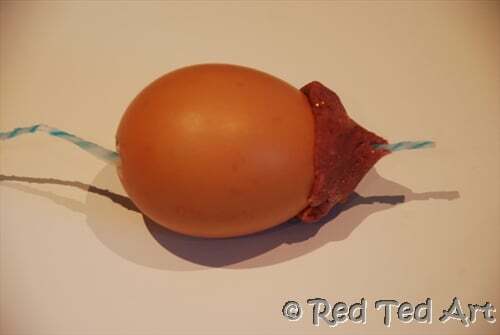 3) Insert your wick – you can make the opening at the BOTTOM of the egg (i.e. the rounder bit) a little bigger to do this, as you will need to open it up anyway to pour in the wax. 4) At the pointy end “seal” your hole and candle wick with some playdough. 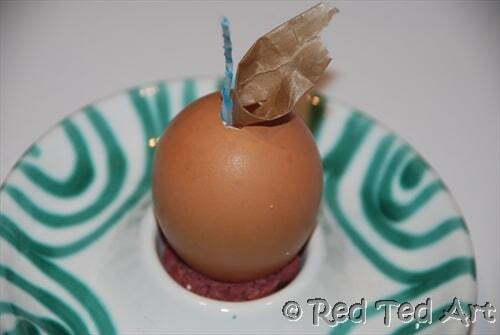 5) Turn upside down and nestly carefully but securely in your egg cup. 6) Make the opening at the round end a little bigger (maybe the size of your little finger nail). At first I used parchement paper as a funnel, but soon discovered that I could pour it in the egg without a funnel just fine. So it is up to you! 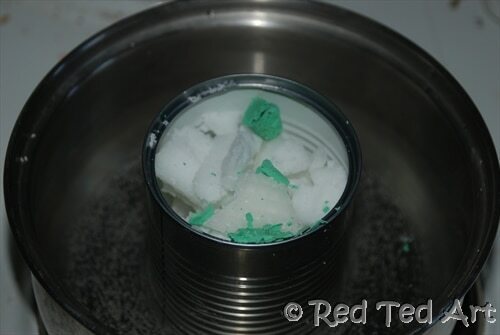 7) Meanwhile start heating your wax, by placing it in the can and the can in a pot of boiling water. 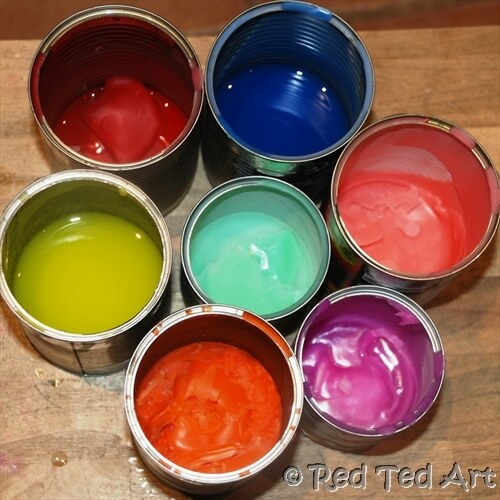 Add about 1/3-1/2 a crayon per can of wax. I discovered that “mixing crayons” (e.g. blue and red to get purple) went horribly wrong and I ended up with a browny purple. I guess this is because crayons are not “pure” colours, even if they look it. So stick to one colour per can. 8. Pour in your wax. Let it cool, pour some more. Wax contracts as it cools, so you will get quite a dip in your candle. You may have to top each egg up 3-4 times. A small hole will always remain at the end. 9) Let cool FULLY before carefully peeling off the shell. Sometimes the shell comes of really easily, other times it does not! Top tip to finish them off – use a hair dryer to carefully smooth the surface and you can place the egg on a warm pot to melt the bottom a little and give you a flat surface for standing! Done! So, what do your reckon? Will you have a go at these homemade candles? 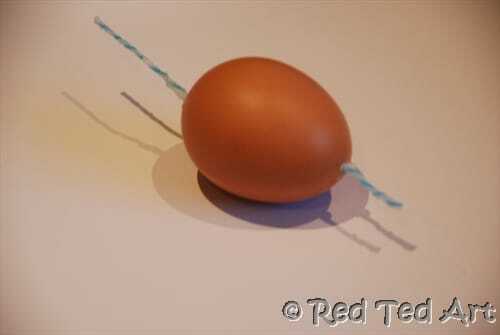 I think they are great fun and will be a great alternative to chocolate Easter eggs this Easter! This is AWESOME! I can\’t wait to do this with my boys! I know that\’s a very generic comment but I had to let you know how cool I htink it is and that\’s all I can say- this is just awesome! Thank you for sharing your great ideas! Hoping to find time to do this soon. That is awesome! You did a great job and they look so cute! 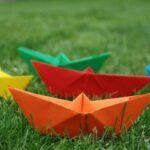 What a nice idea, and a great method to it…I am not sure if I’ll try those but definitely is on my list of things to do ( if not for this than for next Easter). I’ve pinned it. Thank you for the kind comments! And yes, Irina, they can take a while to make.. but if you want to \”speed up the process\”, just make them all one colour.. in some ways changing the colours and having to have all those tins to hand is what made it a \”bigger\” projects… I just carried away! wow, amazing! thanks so much for sharing on craft schooling Sunday, the chicks are great too! Ooh I am curious now as to how Martha did make them!! And Melissa, coming to link now! 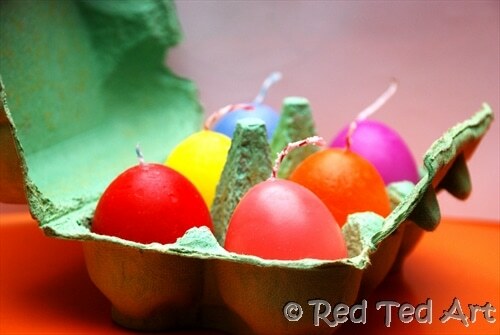 I\’ve been thinking of making some beeswax candles with the kids this year, using egg shells. So, well timed tute! Thank you. I\’ve definitely picked up some great tips ? Very nice. Was wonderin if you have any St. Patrick\’s Day ideas? Would love to see something. Thanks! Sadly, I don’t really…. 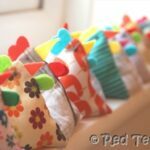 but there are some shamrocks, elves and rainbows linked up here: https://www.redtedart.com/2012/03/07/easter-bonnets/ (scroll down)? I\’m so glad I read this! I have 17 days booked off to coincide with Sausage\’s Easter holiday from nursery and I\’ve promised her lots of crafting. 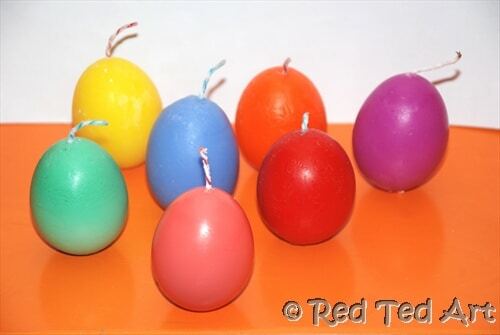 We\’ve already got a plaster of Paris Easter egg kit to do but I love these candles and we have SO many half dead crayons laying around that would be perfect for this! Thanks so much for sharing! My list of things to make over the next few months is ever increasing! Love these. There’s something beautiful about curved smooth shapes. I love how these turned out. I think they would make a fun decoration for Easter or a color-themed event. I just wanted to let you know that I added it as one of my 5 favorite crayon tutorials on my website roundup. Great job! They look great – and the tip about not mixing colours is very handy – that’ll save me a lot of heartache! I have lots of crayons and my daughter and I made candles and they didn’t burn properly. I love your ideas but can you tell me did you use beeswax, paraffin wax or soy way for the base candle? Thank you for your reply. I used “ordinary” candles from our advent wreath and melted them down. You have to take care *some* readers have suggested this is dangerous. But I have never had a problem. We have boxes of beeswax candles leftover from church worship after they get too short to burn. This would be a perfect activity for our older kids at church. We might do this next year though, to give me time to do a trial run. Thank you! Fantastic idea! Yours turn out so beautifully. 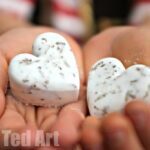 Do you think it would work if I use plastic eggs as molds? Is there something I can put on the inside of the egg before pouring wax in to make it come off easier? Thanks! I have to confess, I don’t know Janice – lots of candle molds are made from plastic, so it SHOULD work. Apparently putting candles in the freezer once they have cooled, helps you get it out of the mold easier. Also, I vaguely remember some sort of talcum powder used in candle making kits.. but I am not sure! 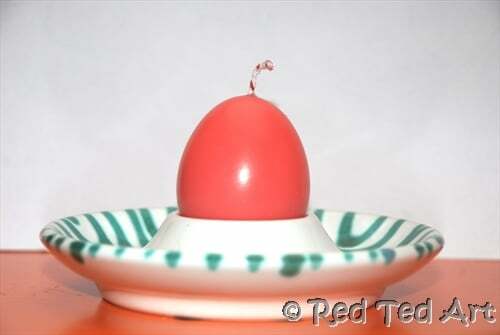 Wow this egg candle is looking just amazing. I definitely gonna try this at my home, I just loved this post. Thanks for sharing this beautiful idea with us.